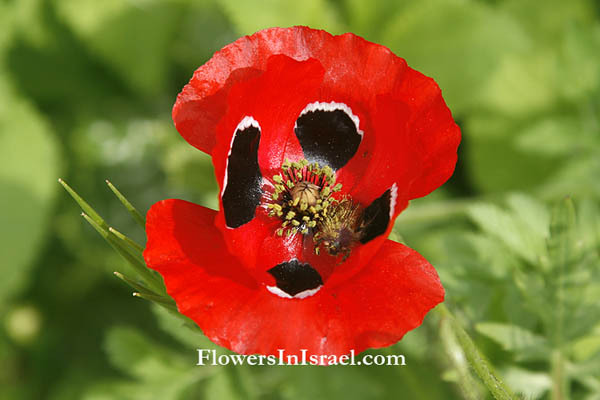 Scientific name: Papaver umbonatum Boiss. 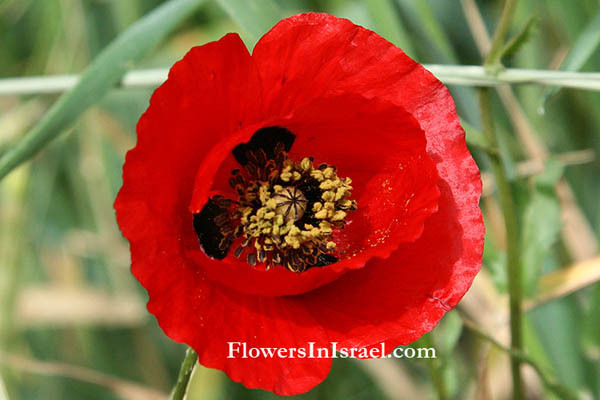 Papaver, the classical Latin name for the poppy. umbonatum, having a rounded projection or umbo in the middle. subpiriforme, sub, partially; pyriformis, pear-shaped, obovoid or narrowly obovoid with a tapering base. The standard author abbreviation Boiss. is used to indicate Pierre Edmond Boissier (1810 – 1885), a Swiss botanist, explorer and mathematician. The standard author abbreviation Fedde is used to indicate Friedrich Karl Georg Fedde (1873 - 1942), a German botanist. 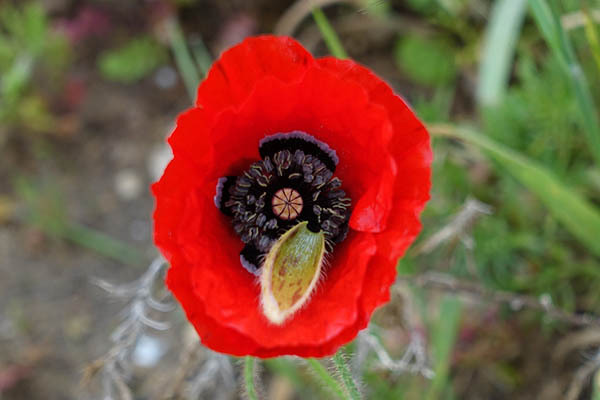 Hybridazation often occurs among Papaver rhoeas P.carmeli, P. humile and P. umbonatum. The “Red Anemone Guild Flowers” comprises some of the species from six plant genera (Anemone, Tulipa, Ranunculus, Adonis, Glacium and Papaver) that belong to three phylogenetically distant families (Ranunculaceae, Liliaceae and Papaveraceae). Flowers of this guild are characterized by large, red bowl-shaped petals that surround a large black mass containing the anthers and the female reproductive organs. 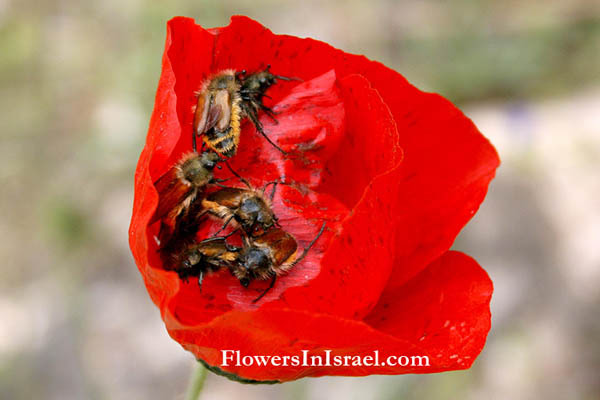 The flowers are insect-pollinated, and offer only pollen as food reward to visitors. The uniqueness of the red anemone guild species is due to the rarity of large red floral displays among the congeners of the guild members, as well as in the Mediterranean flora (Shmida 1981; Dafni & Shmida 1989). Once upon a time, in a far country, there lived a handsome prince. After years of dissipation and tumultuous bachelorhood the prince decided to take a woman in his life, and announced that he would give an evening of “Speed Dating”, free and open to the female audience. Hundreds of women decided to try their luck, including the Three Sisters: Anemone, Scarlet Crowfoot and Poppy. On the appointed day the sisters (like most invited) stormed the nearby mall to get the most up to date garment and the most impressive accessories. The mall was full of women pushing and shopping to get an outfit. Within minutes the sisters had lost each other and only met again when they returned to their homes, each with the result of her shopping frenzy, all with the same red dress. Trouble!? How could the Prince distinguish between the three? After the tears, the blood returned to their faces, and they found a solution: each of them would add a rather unique accessory to her red dress. Anemone added a white scarf she brought from her travels in India. Scarlet Crowfoot (Ranunculus), the trendy, added a green belt, decorated her dress with glitters and put on glossy lipstick. Poppy wore a black beaded necklace around her neck. With the upgraded performance they entered the hall and seized the prince's heart within minutes. He spent an entire day with every one of them, and after three days he admitted he could not reach a decision. The three sisters were also captured by the prince’s charms, and each wanted him for herself. Wow, and another solution was found: the Prince would marry the three of them, on condition that once a year, every year, he will dedicate a period of time with each one separately. Poppy finishes the cycle, with dark circles on the petals. 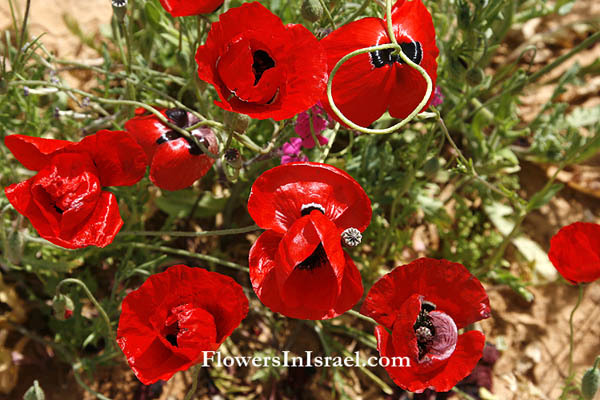 So now you can distinguish the difference between an anemone and poppy. By John McCrae, a Canadian physician and Lieutenant Colonel. who had been killed by a shell burst on 2 May 1915 (World War One). Scarce heard among the guns below. Loved, and were loved, and now we lie In Flanders fields. After John McCrae's poem In Flanders Fields was published in 1915 the poppy became a popular symbol for soldiers who died in battle. That blood of heroes never dies She then adopted the custom of wearing a red poppy in memory of the sacrifices of war and also as a symbol of 'We shall keep the faith', in which she promised to wear a poppy ‘in honour of our dead’. This began the tradition of wearing a poppy in remembrance. The British Remembrance Day - Poppy Day, is always held on the 11 November. This is the day that World War One ended in 1918, when the armistice was signed in Compiègne, Northern France. 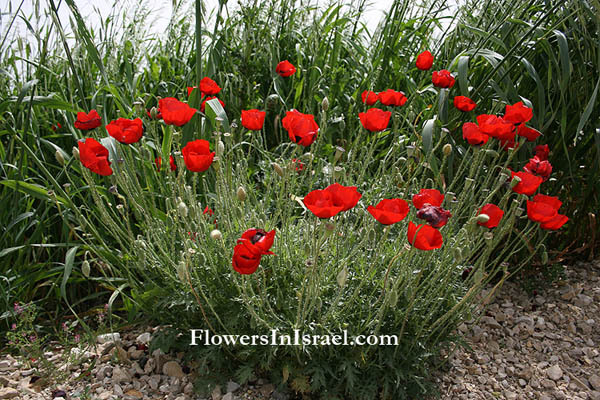 SEE: Helichrysum sanguineum, Red Everlasting, Red cudweed, a symbol for the Israeli Memorial Day for the Israeli Fallen Soldiers and the Victims of Terrorism, Yom Hazikaron, which falls in late April or May.